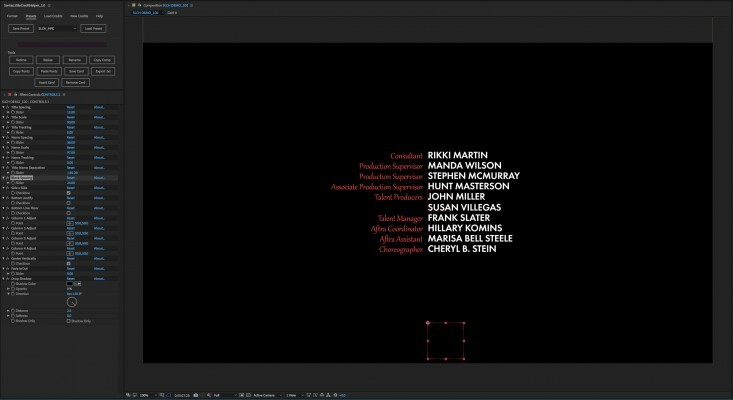 Easy to use tools to create card style credits for web, television, or film projects in After Effects. 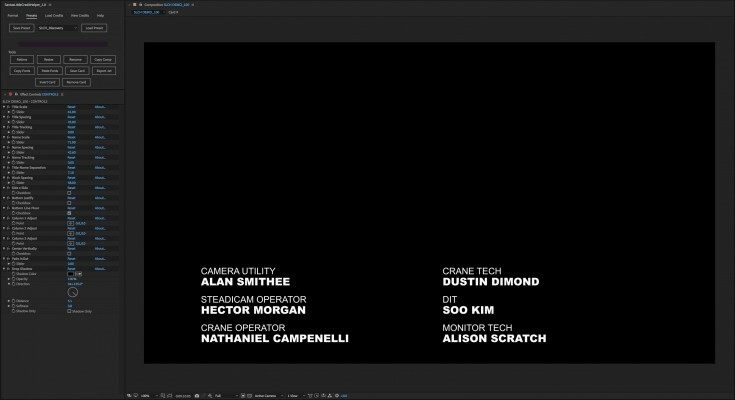 directly into After Effects without re-typing errors. • Layout, Scale, Spacing, Tracking, Shadows, Centering control from a single Null that updates all cards simultaneously and keeps everything in perfect alignment. 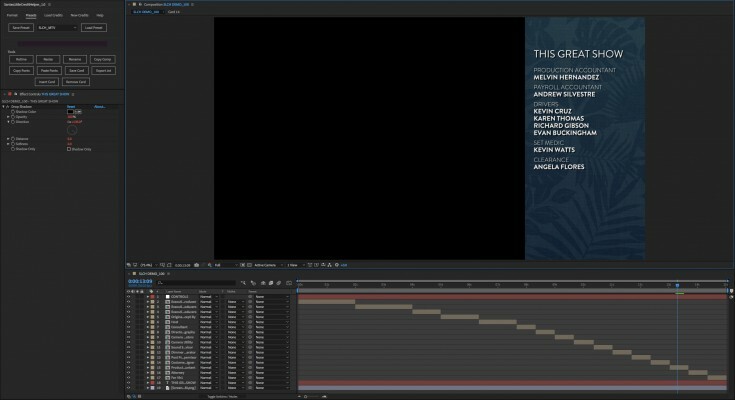 • Multiple Controls can be used to switch between larger full-screen cards and smaller banner cards within a single comp. 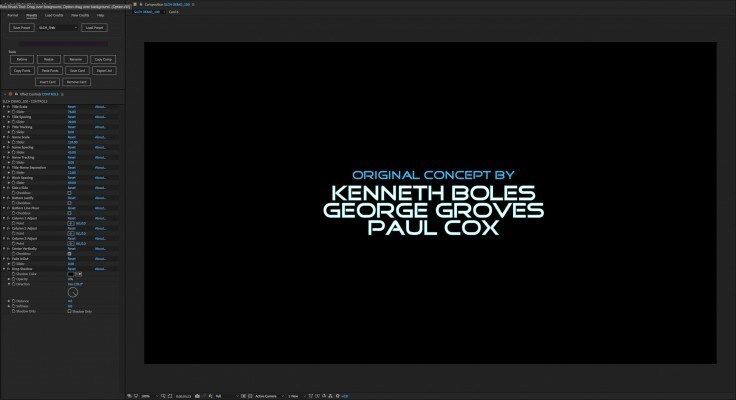 • Copy & Paste Fonts, Color, and Stroke to change the look of your credits easily. • Changes update instantly, and playback with no delay. 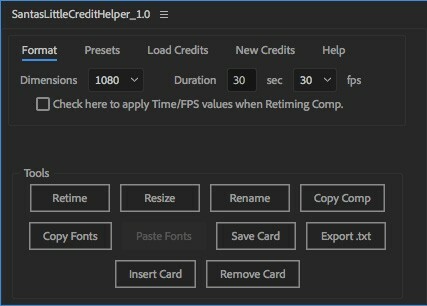 • Resize your credits quickly with Reformat Tools. Switch between HD 720, HD 1080, UHD and 4K instantly. • Edit text, add or remove names, or move names between columns and cards - Layout stays in alignment automatically. • Insert or Remove Cards easily. Credits retime automatically. 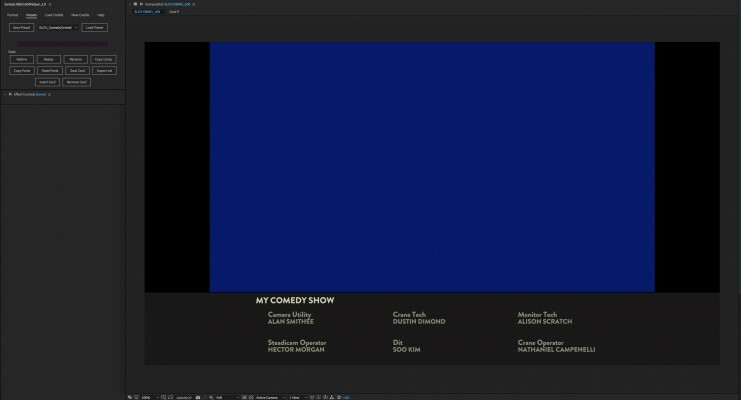 • Save & Load Presets to audition several styles quickly, or save approved looks for use again and again. Some Common Network Presets included. More to come soon! • Export changes to credits back to tab delimited .txt file for error checking and archive. • Final credit compositions are self-contained and can be passed off and rendered without Santa's Little Credit Helper needing to be installed. The User's Manual for Santa's Little Credit Helper V.1.0. Added "Top Line Option" control to allow you to align the top line of each columns first title instead of the bottom line of the title. Added code to remove extraneous quotation marks that get created when loading .txt credits from Excel. Fixed bug where google docs link didn't open properly on MacOS. Fixed "MaskFile" bug on Windows machines when attempting to load credits from a file. You will now be able to select .txt or .tsv files to load. 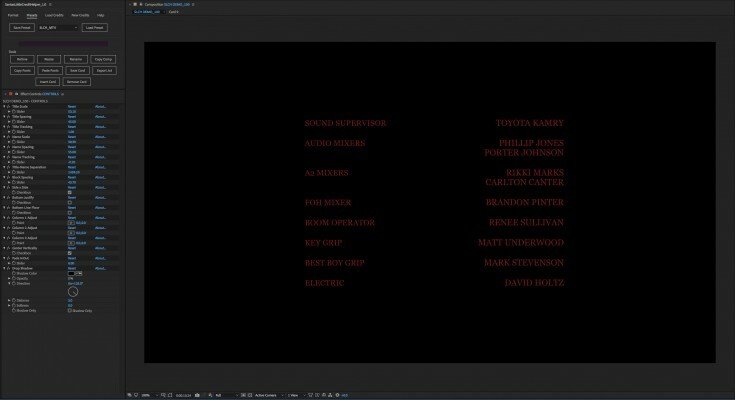 When re-loading and overwriting existing credits, Control and Font settings are preserved in the new Credits. Fixed Windows Compatibility Issues in initializing Presets Folder. Fixed Windows Compatibility Issue with Google Doc Templates Link. Fixed Windows Compatibility issue with file masking when browsing for credit .txt or .tsv files. Fixed Expression errors that resulted from renaming or copying a Credit Comp that includes Saved Cards. Added Link to Tutorial Video on Product page in the Help Tab.